The party is nearly over and I have really enjoyed it. Here's to the next part? Now you can take a breather and sit back and enjoy the drum rolls. Will check out Angela's book. I'm not going to be on internet long but I'll do my best to hop over to Damyanti. 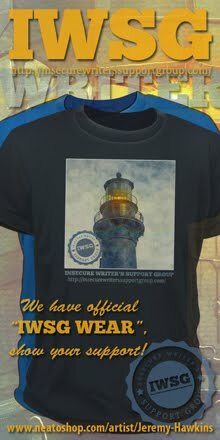 Thanks for another great IWSG. It was a great day. Read the article at Damynati's. It's always good to have someone at your back. We don't need no stinkin' badges, is a line my brother used to say all the time. But I'm so old now, I can't remember which movie it's from. Rek, and April is fast approaching. Anne, I was hoping you'd see it! I think that line came from two movies but I don't remember the older movie either. For you, Alex, IWSG probably fills an entire week! I can't get a single reference, and I'm a little embarassed about the "...badges..." one. Glad you've had such a great party, and sorry that I missed so much of it. I'll head over to Damyanti's tout suite. Great party so far! You've been a very busy man. Party on. You certainly deserve it. Cons are great. Living in Spain now I don't get to attend many, but I'm hoping to attend Eastercon in London this year. I feel like I should not #4... it's killing me. But I've got nothing. Anywho. On a panel at a con? Awesome. As a podcast junkie I get to listen to tons of con panels. I hope to hear you on one. I'm enjoying the party and I'll head over to her blog now. Party ON! Good luck on all you're doing. It'll pay off in the end. trivia... is a great memory... he hates those cans. Jamie, it does! Most of the time, I just can't visit everyone. Sean, Zahn is one of my favorite authors so it would be awesome to meet him! Rusty, you got one. Didn't know you were a podcast junkie though. Richard, I hope so. I'm way behind on visiting everyone that has visited me. Crash Test Dummies!!! The buggers! LOL!! they're the ones! Now I want to watch The Jerk. The Treasure of the Sierra Madre or Blazing Saddles I suppose! I'm sad I couldn't take part in the A to Z blogfest this time around, but will def keep my eyes peeled for the next one! I think it's great that Damy turned her A-Z blog challenge into a book. That's inspiration for you! 4. Troop Beverly Hills (not the first or most well known, but the most recently watched). Steve Martin from The Jerk for number one (just watched part of it the other day) and Blazing Saddles for number four. Don't recall the other two. Okay, its off to Damyanti's I go! Your advice on critique partners is spot on. 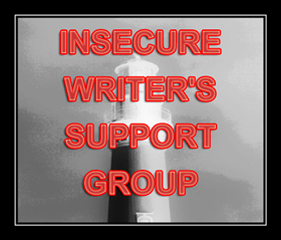 I have several I go to & they've helped improve both my writing & my story while becoming great friends. I'd be nowhere without them. My very first CP was mean & awful & I almost quit afterwards, but he was also right & I actually learned a lot from him, including how to pick better CPs! I only can guess at two trivia Q. #2 - Natural Born Killers? #4 - was that from The Good, The Bad and the Ugly? (Eli Wallach said 'stinking' everything in that movie, a lot. Or was it Reservoir Dogs?) A good substitute when you can't find the right swear word. Keep it going, Alex. 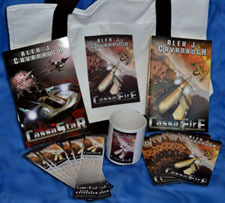 What a great opportunity to be asked to join a sci-fi conference! Please do tell us more. Will check out Damyanti. Checking her out in a non creepy way. 2 – Something with Burt Reynolds? Lurker, got three, and I pulled the quote from the latter. Julie, the A to Z is still coming up, but if you mean the IWSG, next one is April 4. Budd, you got the first one. Nancy, well at least you learned something! DG, sorry! Answers tomorrow. And thanks! Copyboy, first and last are right. You mean I have to wait two more days to party??? oh man, oh man. wow you've been busy! I'm just catching up on all the parties going on here! I recognize those movie lines! But dont know the movies. This is a really cool blog. I really enjoy reading what you have to say. You've been so busy! Hope you'll be able to take a little time to take it easy soon. Gotta answer number #4: The Treasure of the Sierra Madre ... long story for this, perhaps I'll tell you over a beer someday. I'm impressed by Damyanti and will have to visit her blog. I really need to do that A to Z challenge. Christopher, it came from that movie as well, but I quoted a later film. Zahn and I had a great conversation on Science fiction until we were interrupted by a guy in a Jedi costume. Occupational hazard, I guess. A huge con with Bruce Campbell?! I'm green with jealousy. Can't wait to hear the details. Yes, I have visited Damyanti, an interesting place. Participating in a sci fi con with Bruce Campbell! OMG he is only one of my all-time ultimate fave people. I think I have seen just about every movie has done and then some. I cannot wait to hear the deets on this one. And Timothy Zahn, holy guacamole! Man I remember that Axel song, but I just could never ever remember the guy's name. The IWSG has been bar none one of the best things ever created. You know, you're the Ninja Captain and master of the helm of the Insecure Writers' Support Group. You could change it to another day, and I am sure all your friends would switch to help you out! George, sorry! Oh well, take the early birthday wishes. Melissa - I know!! Total awesome. And really good to hear that about the IWSG. Roland, I just need to figure what to do when it falls on July 4th. Oh wow, that's brilliant about the scifi conference!!! How exciting!! Have downloaded Angela's book -thanks for the heads up! Can't wait to hear more about the conference. Are you gonna have a huge tamali hangover from this massive party or what?! Laura, I'll fix his link. And yes, I'm going to crash this weekend and give myself a Tamales hangover. Cool on the sci-fi convention. That's exciting news about the conference. Congrats! Of course I left a comment over at Damyanti's blog. One more day and you'll be two weeks into this, Alex! You are inexhaustible! Third quote is from Splash. Can't wait to hear about the scifi event. Hard to believe, but once again, I don't know the answers to any of the trivia. Whew man, what an excitin' whirlwind you've been on. It's time to sit back an reap the benefits of your talented labors. That is very cool about the flash fiction in an A-Z book! Mark, that's all that matters! Michael, and the day after that I'm going to drop dead. Can't wait to hear more about your awesome conference news! the first answer is Steve Martin - I've always loved that line! I THINK the movie was the Jerk... right??? Julie, a lot happens around here! And my book is finally available for the Nook. You are amazing! Exciting news about a conference. Will look forward to hearing all about it. I stopped absorbing anything new after you said Bruce Campbell! COOL! 4. I think that's been said in a few, so I don't know if I'm saying the original, but Blazing Saddles? They say it in Troop Beverly Hills, too. There were some great posts, Alex. You're right there! Steve Martin's delivery of that line (#1 above) was one of the most humorous moments in cinematic history - in my humble, non-movie goer's opinion. Congrats on the book release, hope the party's a blast! 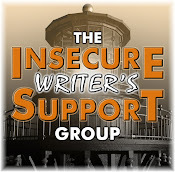 I've been reading the Insecure Writer’s Support Group! posts. They rock. Shannon, that's funny! You got two. Ella, they were really amazing this week. The only one I'm positive about is The stinkin' badges one. From The Treasure of Sierra Madre. I am late to this party since I had no internet time last night. I think I will miss this CassaFire Tour when it ends! But I hope I can score some swag from Lemur!! Dafeenah, some days it's not easy, but I'm always trying. Anthony, originally yes! I went with the Blazing Saddles version. Chuck, you'll find out Monday.